Colorspace Colorspace Colorspace where fore art though Colorspace? If you are using Aperture 3 and shooting RAW then you are already covered, don’t do a thing. Sort and edit and process your little heart out without worrying about color space during these processes. Your export choice will be where the decision is made. Let’s start at How Many Crayons? Fewer crayons in larger box. 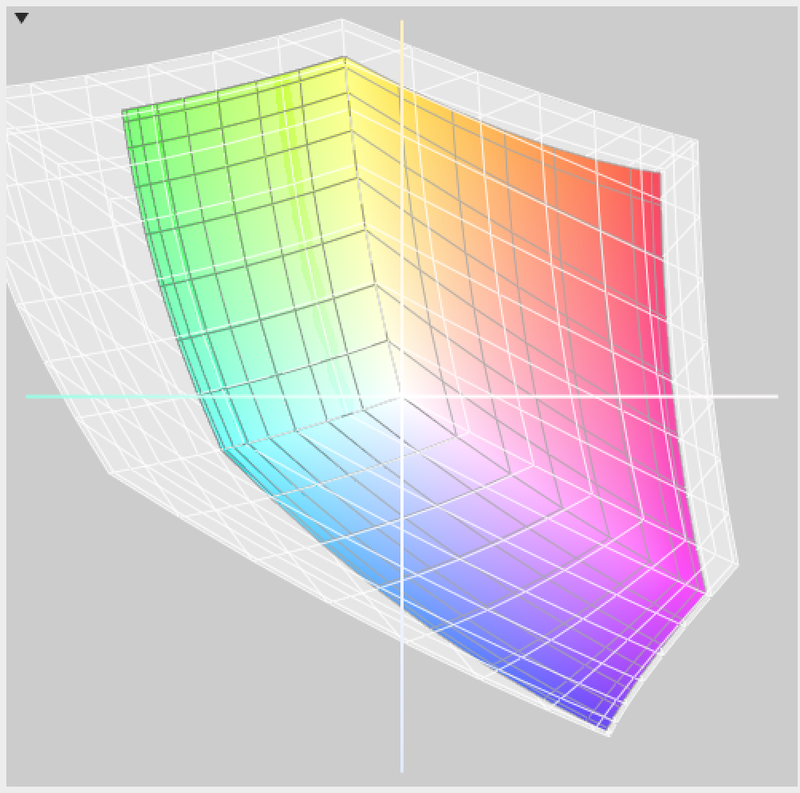 sRGB in Adobe RGB colorspace. The best way to explain what color space is the simple childhood memory of standing in aisle in Walmart staring at the boxes of crayons. This one has 8, this one has 16, this one has 64! Wow there’s three different dark greens! Thats colorspace pure and simple.Each version has a different number of crayons and different colors. This is called Color Gamut. Here’s what it looks like when you put the crayons from a small set into the box from a big set. Where are your drawings going? To choose which crayon box you have to know where the drawing is going. Is it going on the fridge door or framed in the airport. It matters. If you do this for MPixPro you’ll see they use sRGB exclusively. If there is a choice use the one with more colors. So if you use Aperture 3 heres where color space comes into play, as you export jpegs for the print shop. To find out it’s color profile just google, “Google: Owners manual .pdf (printer name)” and find it. For Windows 7 and before to Settings>Printers and Faxes, find your printer, right click and select properties. Click on the Color Management TAB and you will see a box titled “Color Profiles Currently Assiciated with this Printer”. 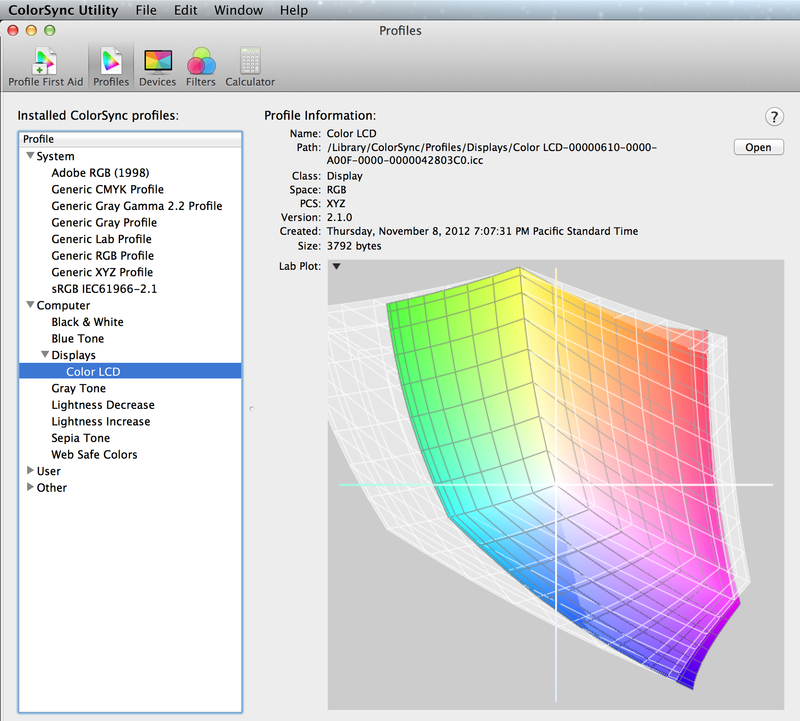 For Mac users use Color Sync Utility. One sweet extra is if you click the arrow in the top left of the window and choose hold for comparison you can see two color spaces layed on top of each other like the above and below pictures. Simplistically speaking, choose and export to the one with the most colors. It’s not quiet that easy as various printers have specific color spaces. So they may have 16 blue crayons but only 3 red. Colorsync Utility showing extra blue colors on Retina’s colorspace compared to Adobe RGB. Simple here, export it as sRGB. Its not just about wasting empty crayon box space its about not knowing what you’re getting. Even more simple, don’t export it. If you have to because your sotrage method does not take RAW files then choose the one with the most colors. For instance I do my offsite backup with SmugMug. For my best shots I send them off as .png’s in Adobe RGB. The ideas and concepts here were obtained after reading this article and a discusion board at PPA‘s The Loop.